Two more models to download from the Brother website. 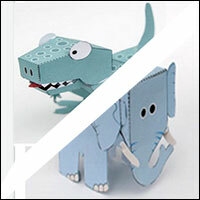 These two are new improved updates of paper projects that have previously appeared on robives.com. They are available for free for everyone to download and make. I hope that you enjoy them! The pop-up elephant comes in a mother and baby pack. Fold them flat, when they are released they pop up powered by the elastic band inside the linked boxes! The poseable T.Rex is a great addition to any desk. Free to download at the Brother International website. Have fun!